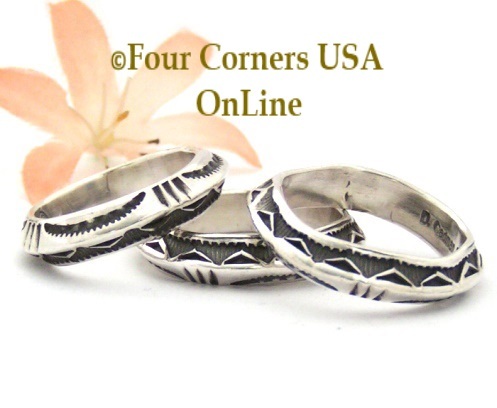 A wonderful selection of Native American Wedding Rings, Engagement Bridal Ring Sets, Inlay Band Rings and Gold Silver mixed metal overlay band Rings in stock for immediate delivery. 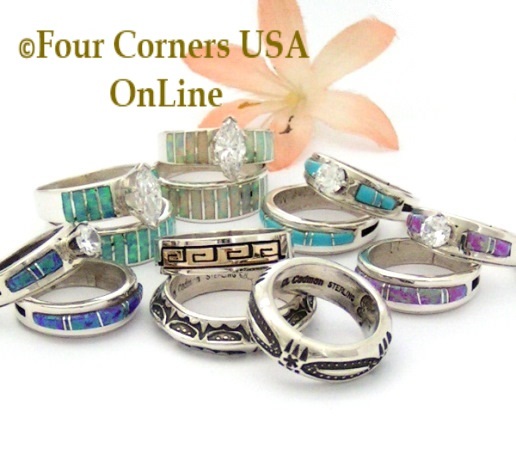 Four Corners USA OnLine Native American Wedding Ring Collection features Navajo Inlay Jewelry Silversmiths Ella Cowboy and Wilbert Muskett Jr.
Inlay Turquoise Bridal Engagement Ring Sets including Inlay Turquoise Wedding Band Rings for Bride and Groom. 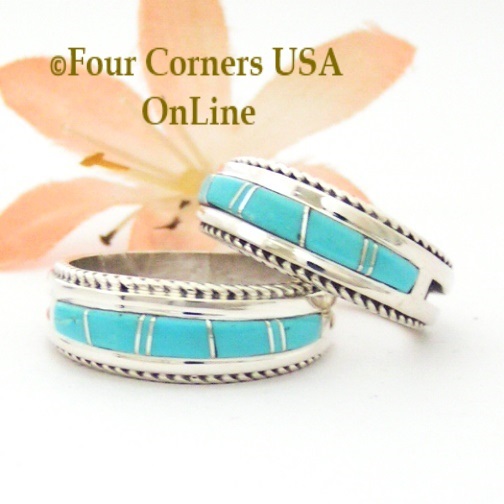 These wonderful clear blue Turquoise Rings are available in two styles by Navajo Silversmiths Ella Cowboy and Wilbert Muskett Jr.
Southwest Native American Navajo Artisan made Wedding Rings, Wedding Bands, Engagement and Bridal Wedding Ring Sets for your Special Day! Native American Artisan Wedding Rings are symbols of love, faith, and honor for some traditional and non-traditional wedding ceremonies. A wonderful selection of Native American Inlay Band Rings in a variety of natural stone and colorful Fire Opal in stock for immediate delivery. Our Native American Inlay Band Ring Collection features Navajo Jewelry Silversmiths Ella Cowboy and various styles by Wilbert Muskett Jr.
Inlay Band Rings are offered in a multitude of colors and various styles to suit your personal style. 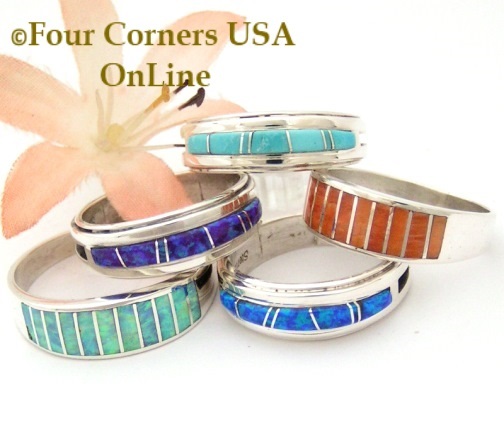 Beautifully handmade Sterling Silver Band Rings inlaid with Turquoise, Spiny Shell, Red Coral, Black Jet, Gaspeite and Fire Opal in various colors such as Purple, Pink, White, Blue. Our Newest design is quickly becoming our most popular with a twisted wire Rope edge in weights for both Men and Women and are currently available in Turquoise, White, Purple and Blue Fire Opal. 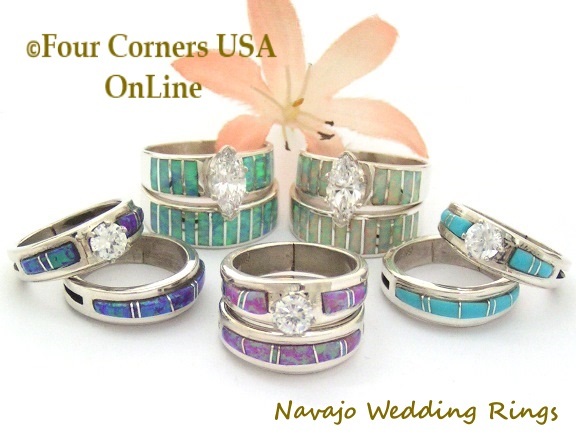 Traditional Native American Navajo made Wedding Rings, Bridal Engagement Ring Sets, Inlay Band Rings and classic 14K Gold Silver Bands are a wonderful and personal self-expression for your Special Day! These beautifully handcrafted rings make excellent Anniversary Gifts and are perfect for Renewing Vows, Commitment Ceremonies or just an Alternative Wedding Ring to vary your style and compliment your wardrobe. 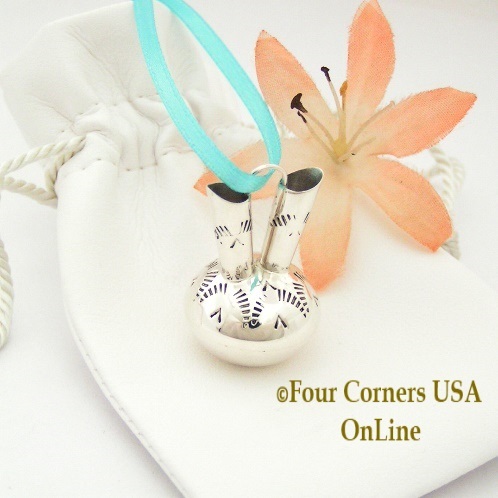 Sterling Wedding Vase Miniature by Native American Navajo Artisan Silversmith Wesley Whitman. Exquisitely crafted Sterling Silver miniature Wedding Vase with mirror finish and various stamping including SunRays (Happiness) and Rosettes. The Wedding Vase is a sacred tradition in many Native American cultures. The two spout Wedding Vase plays an important role as part of the Wedding ritual and is symbolic in design with each spout representing each partner connected in unity by the handle. 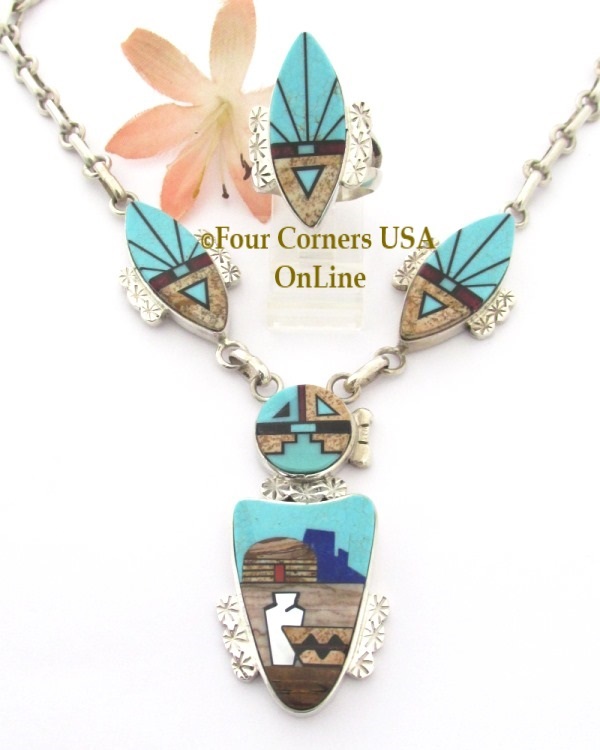 The Center focal point of this exquisite three piece Necklace is a SunFace Kachina with Pueblo scene showcasing two large vessels (vases), Hogan and blue mountain majesty against a Turquoise Sky invoking a celebration or gathering. The two side pieces blend in color and stone perfectly outlining the SunFace with Sun Rays. An Heirloom in the making...what a wonderful Wedding Day gift!